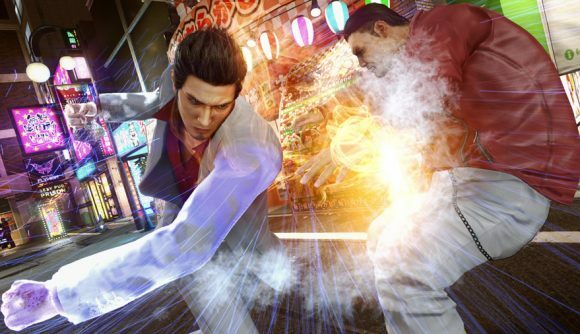 April 10, 2019 Yakuza Kiwami 2 is officially on its way to PC, and it’s arriving very soon. After an ESRB posting and teasers from Sega itself made it pretty clear that Yakuza Kiwami 2 would soon be coming to PC, the release has now been officially confirmed. In a press release issued earlier today, Sega revealed that the remake will arrive on Steam on May 9. Yesterday, Sega changed its image on Steam to a picture of Goro Majima’s eyepatch emblazoned with the company logo. The detail on the image makes it look very much like the most modern Yakuza titles, and Sega has done similar teasers for previous PC ports from Puyo Puyo Tetris to Catherine. You can see the new image on Sega’s publisher page. Yakuza Kiwami 2 is a remake of 2006’s Yakuza 2, and it follows Kiryu as he’s called back into action after the assassination of the Tojo Clan’s fifth chairman. The Kiwami 2 version uses the same Dragon engine first seen in Yakuza 6, and includes new material that covers the story of uber-cool eyepatch-wearer Goro Majima. Kiwami 2 also brings back the popular cabaret club management mini-game from Yakuza 0 and the clan creator system from Yakuza 6. Yakuza Kiwami 2 debuted in Japan in December 2017, with a world-wide release following last August. It’s encouraging to see Sega moving to port the latest entry in the series to PC, even if it is technically a remake of a 13-year-old title. While previous teasers have made it clear that the game’s on it’s way, this is the first time we’ve been offered a concrete release date. Thankfully, however, we’ll only be waiting a month for our next trip to Japan.